I'm sure that Susan Blackmore is a wonderful woman, but her TV persona, as a research scientist wheeled out to provide the "rational" refutation to any mystic or believer in the occult, always makes me angry. She may well be correct that it is all hokum, but it is the duty of an honest, sceptical scientist to remain neutral, evaluate the evidence, and propose a hypothesis. It is not their duty to come across as an arrogant, convinced skeptic with a smug grin and a superior pre-held negative attitude to everything non-material. 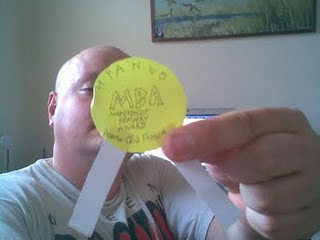 A gold MBA is well earned here.